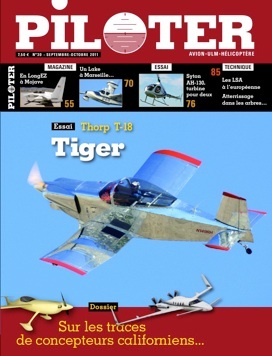 Google PILOTER magazine and you will see the cover of the September/October 2011 magazine. Ray Henning's perfectly plans built example is the subject of the T-18 Tiger article. Available on newstands in France. Last edited by Anonymous on Sun Oct 23, 2011 11:14 am, edited 1 time in total. Now there is a paint job that Mr. Thorp might approve of! Last edited by admin on Sun Oct 23, 2011 11:53 am, edited 1 time in total. Beautiful metal work! Just the right amount of paint. Last edited by admin on Sun Oct 23, 2011 2:17 pm, edited 1 time in total. Where can i see this Thorp???? Last edited by admin on Sun Oct 23, 2011 3:32 pm, edited 1 time in total. Personally I like more paint. Last edited by admin on Sun Oct 23, 2011 6:42 pm, edited 1 time in total. Looks like this Thorp belongs to Ray Henning, Lynnwood, WA USA. Has an USA "N" number and flown right seat, unless the layout person reversed the photo. Last edited by admin on Mon Oct 24, 2011 3:41 am, edited 1 time in total. I'll be in Paris tomorrow. I will look for it at the airport. If it looks good we can scan for the rest of the group to see. Last edited by admin on Mon Oct 24, 2011 6:52 am, edited 1 time in total. 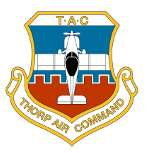 That's the Thorp that was the subject of the Feb 2010 Article in Flying "Clipped Wings". Sadly after 44 years of construction the plane was finally complete then Ray was diagnosed with macular degeneration and had to give up flying. it has been for sale for a while now and is maintained and flown by Mike Melville (of Rutan fame) out in Mojave. I've spoken (email and in person) with Mike a few times and even sent him a set of brake pedals to install in the airplane (for the RH seat), which he did. there was a lot of concern that some yahoo was going to buy the airplane and tear it up and or change out the steam gauges etc and make a mess of what has been describes as a "work of perfection." I offered to help Mike find a reputable buyer for it but have not heard from him lately. Here's the article in Flying ..
Last edited by admin on Mon Oct 24, 2011 7:27 am, edited 1 time in total. Just heard from a reliable source that one of our own may have just bought this airplane ... if you got excited or wrote down the phone number from the ad .. sorry. Last edited by admin on Mon Oct 24, 2011 7:43 am, edited 1 time in total. The airplane is now owned by Scott Ginn. Look for a five ship Ginn family photo soon. Last edited by admin on Mon Oct 24, 2011 8:50 am, edited 1 time in total. Roger that thanks Scott ... glad to hear it's in good hands! Last edited by admin on Mon Oct 24, 2011 8:51 am, edited 1 time in total. From where I'm sitting now, that was a bargoon. I managed to extract my gear A-Frame on the weekend. That which does not kill us makes us stronger. Last edited by dickwolff on Mon Oct 24, 2011 9:13 am, edited 1 time in total.